Urban dwellers know one thing all too well, that no "space" is a free space, especially the space is for your modern steed. In search of a solution for urbanites, Land Rover designed the Range Rover Evoque, the first of its vehicle class in the 60+ years of the company. Powered by either a fuel efficient diesel engine, a turbocharged 2.0-liter six-cylinder engine rated at 240-horsepower, or a turbocharged four-cylinder engine, the Range Rover Evoque is a derivative of the LRX concept car seen a few years ago. Developed to be a full fledged SUV, it retains all the rugged heritage of Land Rover, including the advance Land Rover Terrain Response, a smart all-weather and terrains drive system. Though the vehicle&apos;s on permanent 4-wheel drive mode, its drive management system is adaptive, which equals to less fuel consumption. But when you think of Land Rover, its not only about the all-terrain capability. 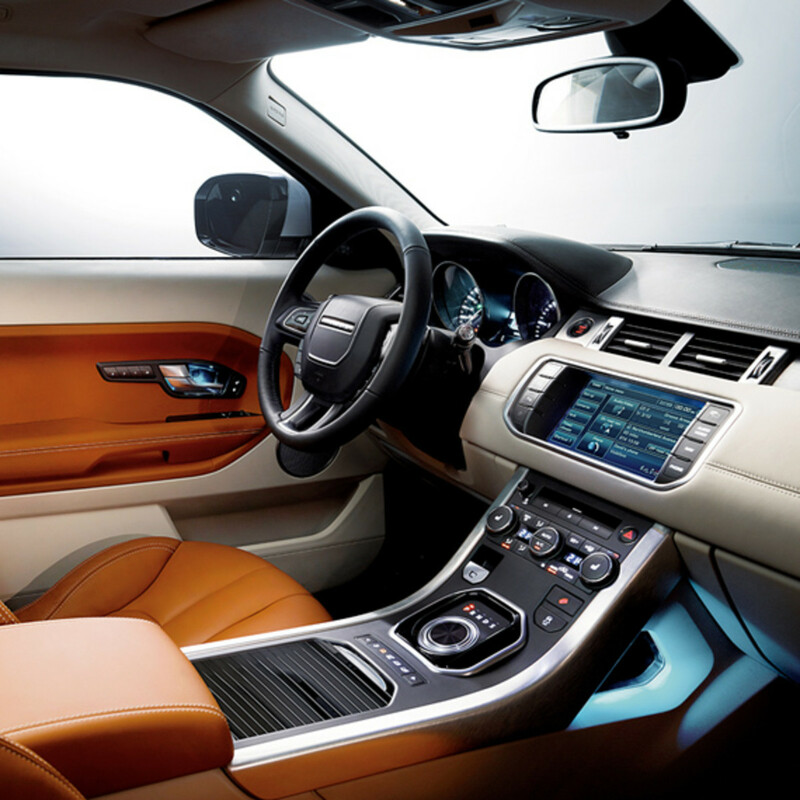 Similar to its larger cousins, the Evoque is richly appointed with premium leather upholstery and HiFi system that will rival against any audiophile&apos;s home. Yet, its compact form factor means you can park it almost anywhere in the city without worrying about your "tail stick beyond the curb". Available at 160 countries this Fall with stick price starting at $45,000. MAHWAH, N.J., Nov. 10, 2010 The exciting five-door version of the all-new Range Rover Evoque makes its global public debut at the 2010 Los Angeles Auto Show on November 17, 2010. Like the coupe, the five-door Range Rover Evoque remains faithful to the spirit of the groundbreaking Land Rover LRX concept car, offering an innovative new interpretation of the original coupe design. The five-door Range Rover Evoque also stays true to the core values of the Range Rover brand, providing premium levels of craftsmanship, luxury, performance and renowned Land Rover multi-terrain capability, but in a more compact package. "The addition of the five-door to the Range Rover Evoque line-up extends the appeal of our brand still further," said Land Rover&apos;s Managing Director Phil Popham. "While retaining everything that&apos;s great about the Range Rover Evoque coupe, this new five-door bodystyle will offer customers even more choice, greater practicality, versatility and flexibility. 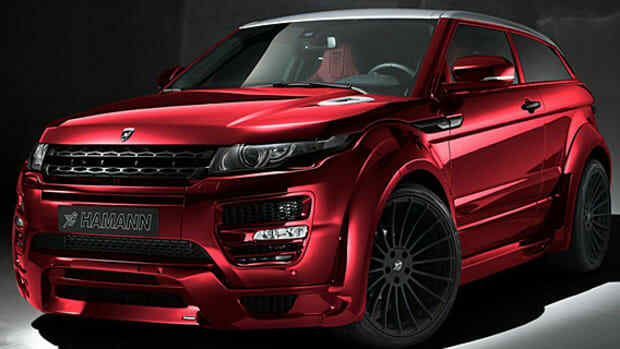 The launch of the Range Rover Evoque in 2011 will expand the global appeal of the Range Rover marque." The five-door Range Rover Evoque offers an exciting new interpretation of the LRX concept car design, combining the dramatic stance and dynamic appeal of the original cross-coupe with the enhanced functionality offered by a five-door format. "The five-door Range Rover Evoque has the same strong emotional appeal as the coupe, while offering superior versatility," said Land Rover Design Director, Gerry McGovern. "The key lines remain intact the dramatic rising beltline, muscular shoulder running the length of the car, and the distinctive taper to the floating roofline but with a slightly higher rear roof. The finished vehicle offers impressive levels of space and versatility whilst retaining the overall essence, visual robustness and jewel-like detailing of the coupe." The more spacious interior of the five-door Range Rover Evoque has been achieved without enlarging the compact footprint of the coupe model: the overall length and width remain identical. Like the coupe, smart design, meticulous engineering and clever packaging has ensured that the five-door Range Rover Evoque delivers the core Range Rover values of luxury, refined performance and multi-terrain capability while remaining true to the spirit of the LRX concept design. Beneath its dramatic exterior, the five-door Range Rover Evoque provides customers with an impeccably crafted luxury cabin, with the same premium quality materials and elegant design expected from a Range Rover interior. Gerry McGovern continued, "The strong, simple architecture of the cabin is evident with the bold intersection between the solid horizontal elements of the instrument panel and the powerful vertical lines of the center console." 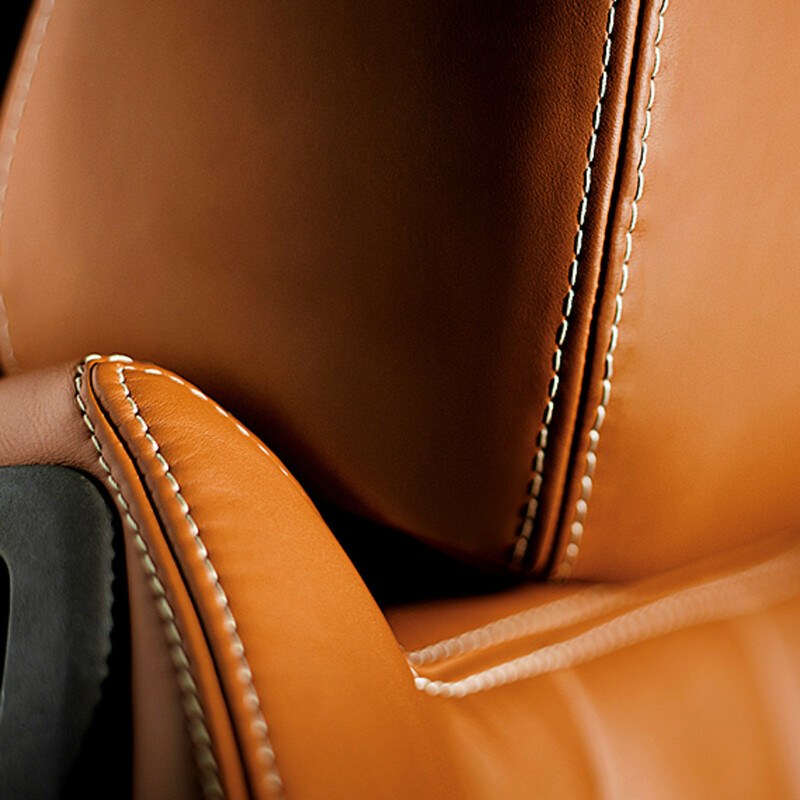 The Range Rover Evoque allows customers to specify a lavishly appointed cabin with soft, premium leather providing a luxurious finish to almost every surface of the instrument panel, doors and seats, with beautifully tailored twin-needle stitching. In bold contrast to the supple feel of natural hides, authentic metal finishes provide a series of striking highlights. Cool to the touch and exquisitely crafted, the metal finishes are a tactile and visual reminder of the superior interior quality. The instrument cluster, housed under a compact curved binnacle, adds to the sporty, premium feel of the interior. The twin dials have an attractive three dimensional form with illuminated chaplets and needles, and are set deep in sport circular housings finished with bright chrome rims. Measuring 1.18 inches (30mm) taller than the coupe model, the five-door Range Rover Evoque adds space and versatility to the luxurious cabin. Rear seat passengers benefit from over 1.97 inches (50mm) more shoulder room, along with generous headroom, which compares very favorably to traditional sporting sedans. A full-sized glass panoramic roof enhances the sensation of space and comfort by filling the interior with natural light, and offers greater headroom for all occupants. The rear seats, with seat belts and head restraints for three passengers, have 60/40 folding rear seats and are equipped with LATCH child seat mounts. When required, luggage capacity can be expanded to a substantial 51 cubic ft (1445 liters). The driver adopts a lower seating position than in one of the larger Range Rover models offering a more sporting feel but retaining the important Command Driving Position. Land Rover engineers have developed the five-door Range Rover Evoque to provide customers with a polished driving experience combining dynamic and sporty handling with responsive, effortless performance and refinement. Murray Dietsch, Director of Land Rover Programs said, "The five-door Range Rover Evoque has the same sporting character as the Coupe. We have focused on ensuring that the car is agile and fun to drive, so that customers have a rewarding experience, even in day-to-day urban driving. Advanced technologies such as MagneRide mean we can ensure that this dynamic prowess does not come at the cost of top-quality refinement or comfort." The car can be specified with the sophisticated Adaptive Dynamics system, which uses advanced MagneRideâ„¢ dampers to provide an enhanced balance of confident, nimble handling with a supple, controlled ride. The suspension delivers even tighter body control with flatter handling and sharper responses. 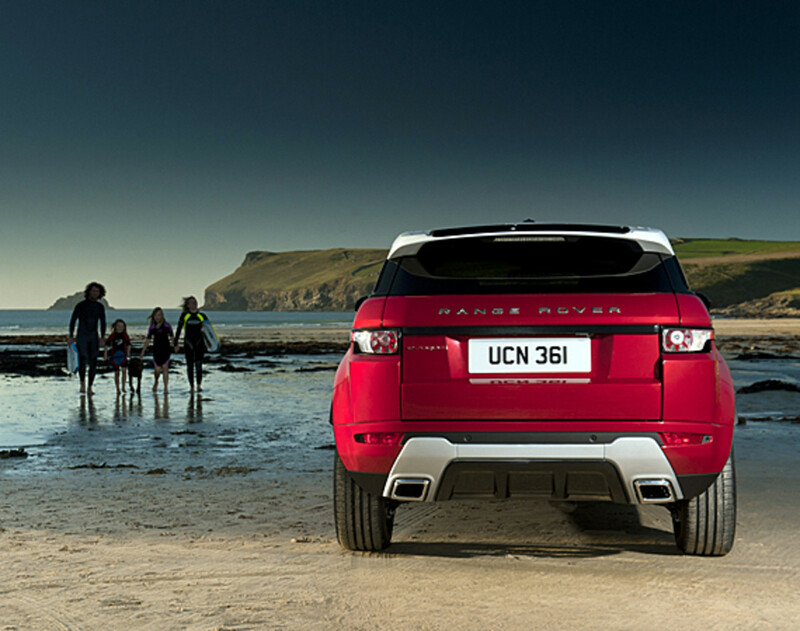 As expected in a Range Rover, the five-door Range Rover Evoque delivers all-weather, multi-terrain capability. In common with its larger siblings, the new model provides formidable multi-terrain potential, which is enhanced by the latest version of the company&apos;s signature Terrain Response® system. Drivers who take their Range Rover Evoque off-road will be reassured to know that, in addition to generous ground clearance, the car has aggressive breakover and departure angles. 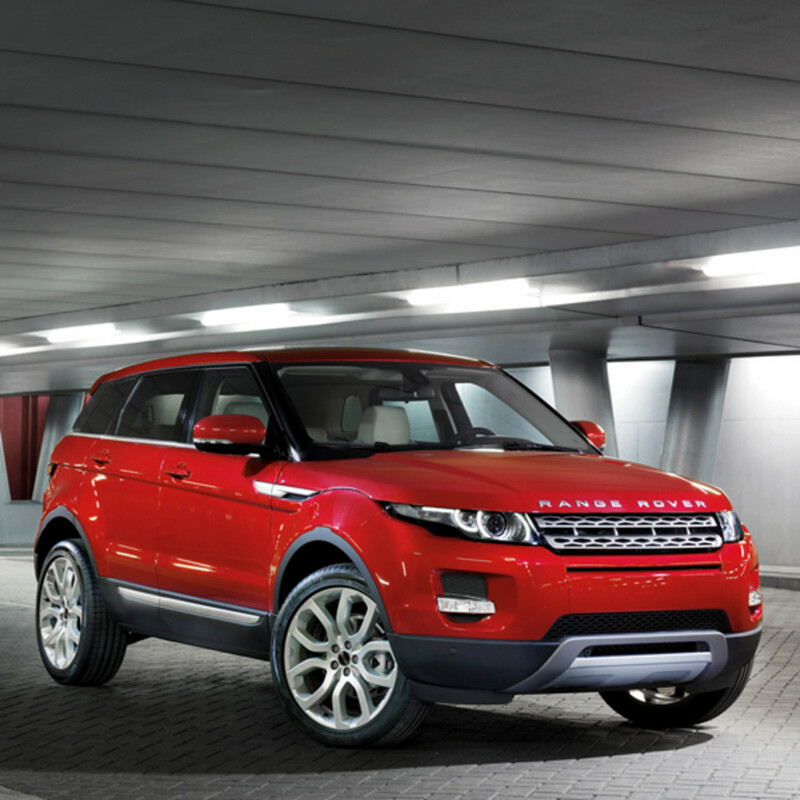 The five-door Range Rover Evoque shares its smooth and responsive turbocharged powertrain with the Coupe model. The advanced new 240bhp* 2.0-liter Si4 turbocharged engine combines direct fuel injection and twin variable valve timing for drivability and fuel efficiency, and an athletic 0-60 mph in 7.1 seconds*. Murray Dietsch continued, "The state-of-the-art four-cylinder turbocharged engine combines six-cylinder refinement and performance with impressive fuel economy. This efficiency has been achieved by the commitment of the product development team to deliver a compact and weight efficient product, with no compromise on durability and robustness." 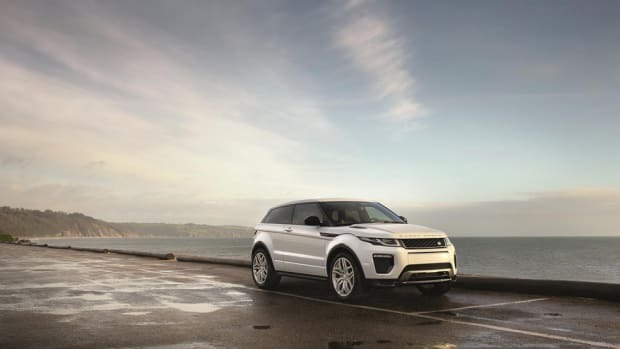 With the same compact footprint and advanced technologies as the coupe model, the five-door Range Rover Evoque reinforces Land Rover&apos;s commitment to environmental sustainability. 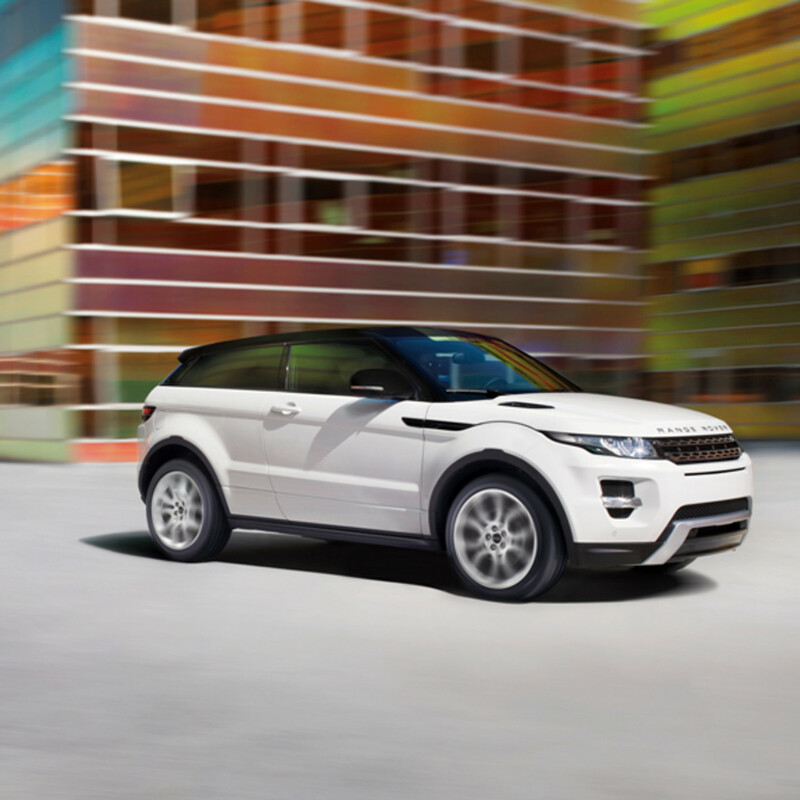 The Range Rover Evoque is the smallest, lightest, most fuel-efficient Range Rover ever. The new vehicle&apos;s sustainability credentials stem from a comprehensive approach to reducing its environmental impact throughout the product lifecycle, from development and manufacturing, through to customer use and end-of-life recycling. Range Rover designers and engineers have developed a host of distinctive and innovative features, to ensure the five-door Range Rover Evoque stands out from the crowd. light-blade technology. A similar graphic is repeated in the LED rear lights, with their jewel-like 3D petal design. Approach the vehicle at night, and you will also see a bold graphic alongside the front doors, illuminated by the &apos;approach lights&apos; which shine from the mirrors. More special touches greet you when you enter the car. The interior displays come to life with a choreographed animated start-up sequence, while the rotary auto shifter completes the &apos;greeting&apos; as it rises silently into the driver&apos;s hand. LED ambient lighting provides sophisticated and precise illumination within the cabin, with a range of colors which can be chosen by the driver to suit their mood. Select Dynamic Mode, and a sporting red color scheme fills the interior as well as in the instrument dials and cluster display. To complete the range of features, the first panoramic roof ever fitted to a Range Rover vehicle can be specified, providing an all-round vista which helps to make every journey a special occasion. - Pure combining the stunning concept-car exterior with stylish, clean interiors in neutral colors to highlight the pure, simple forms of the cabin architecture. Soft-touch, wrapped materials on the major surfaces contrast with the real-metal brushed aluminum trim. - Prestige ultimate Range Rover luxury, combining a bespoke exterior with unique, standard 19-inch wheels, plus an optional 20-inch wheel, and sparkling metallic details with an indulgent interior which is almost entirely leather wrapped. Luxurious duo-tone color schemes, with premium leather, twin-needle stitching and real wood and metal finishes. - Dynamic bold exterior with available 20-inch wheels and unique bumpers, sills, grille and tailpipes for a more assertive, confident stance. A premium sports interior with perforated leather seats and unique sports detailing are included. Contrasting roof and spoiler colors are available as a personalization option. 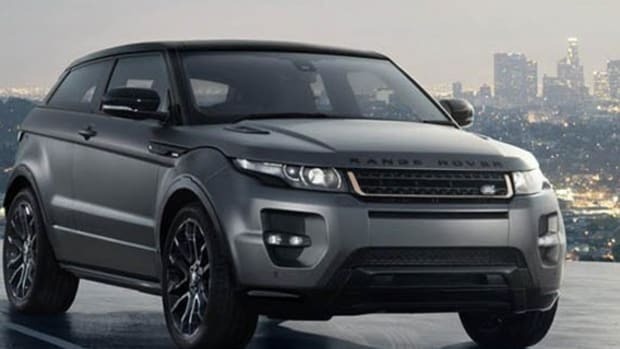 Like the coupe model, the five-door Range Rover Evoque benefits from the same comprehensive selection of the latest technologies as the larger Range Rover models, in terms of controls, connectivity, comfort and convenience for all occupants. From the driver&apos;s viewpoint, the Range Rover Evoque is distinguished by a carefully conceived system of controls and displays which combines a stylish, uncluttered layout, state-of-the-art functionality and ease-of-use. At the heart of the control system is the Range Rover brand&apos;s 8-inch (203mm) high-definition touch-screen display with its crisp graphics and simple, intuitive menu structure. Tech-savvy customers get the connectivity they demand with a comprehensive package that includes Bluetooth® hands-free mobile phone use and audio streaming, plus a range of USB and auxiliary inputs for iPod® and other portable devices. The Range Rover Evoque is the first Range Rover to offer breathtaking new sound systems developed in partnership with the high-end audio specialists Meridian. The premium Meridian offering is an 825W 17-speaker system which delivers the ultimate in surround sound performance. Both coupe and five-door models of the Range Rover Evoque will be manufactured at Land Rover&apos;s multi-award winning Halewood plant in Merseyside, UK. The car will go on sale in more than 160 markets worldwide, with North American deliveries from Fall 2011. Indicative pricing starts around $45,000. 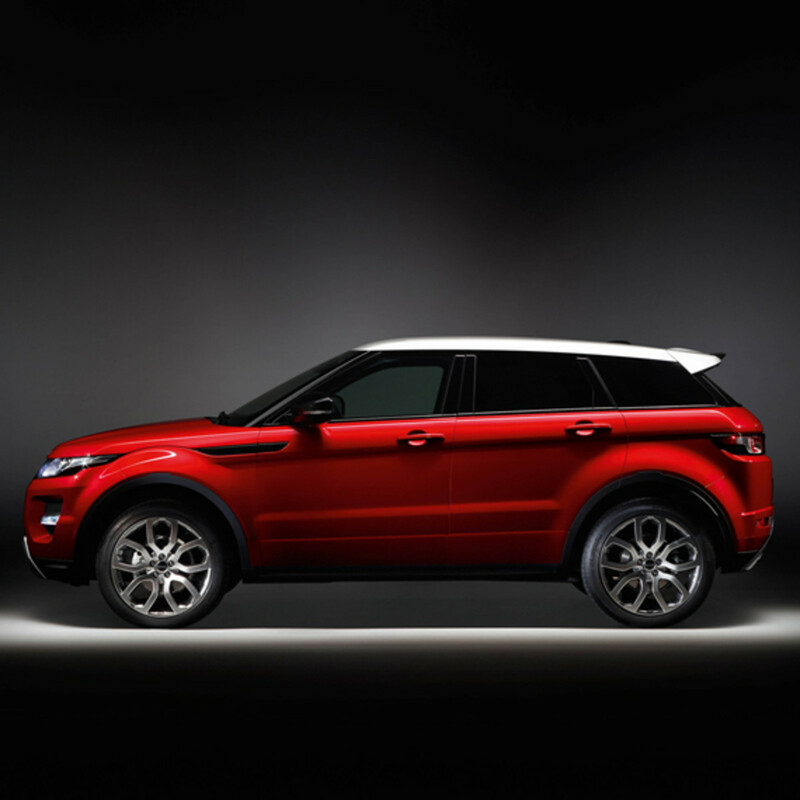 Phil Popham said, "The launch of the Range Rover Evoque is a significant step forward for the Range Rover brand. This groundbreaking car brings new excitement and broader relevance to the brand, but remains true to the values of premium luxury and performance which have made Range Rover such an enduring success story over the past 40 years." The five-door Range Rover Evoque offers customers an exciting alternative to the coupe model, with an innovative new interpretation of the LRX concept car design. The five-door bodystyle combines the dramatic stance and dynamic appeal of the original cross-coupe with the enhanced functionality offered by a five-door format. Gerry McGovern, Land Rover Design Director said, "We set out to give the five-door Evoque the same strong emotional appeal as the coupe, while offering superior versatility. Very careful execution of the design has made sure that the unique and exciting spirit of the LRX concept has remained intact." 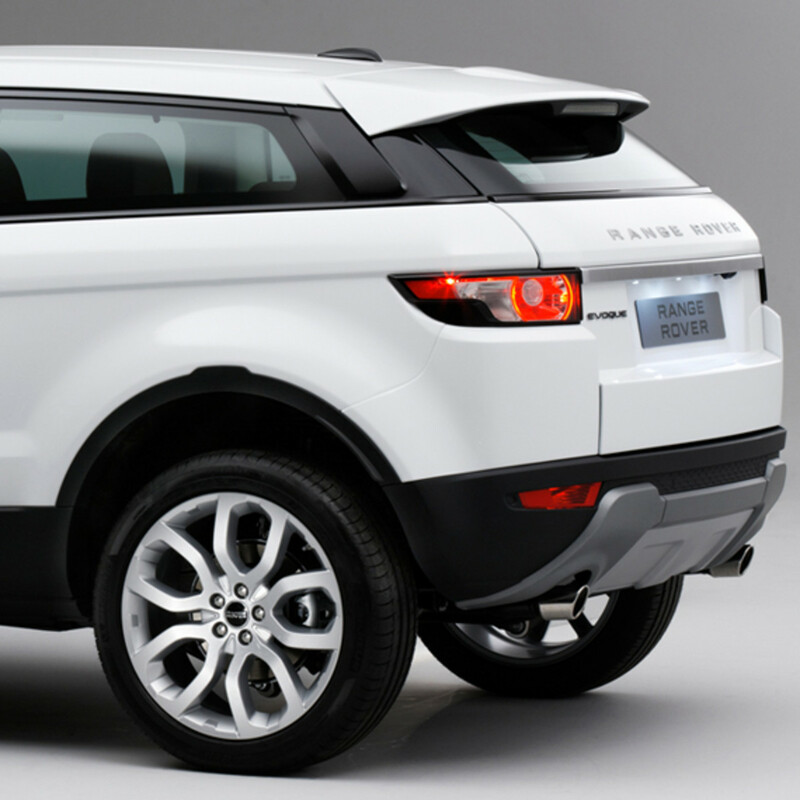 The design of the five-door Range Rover Evoque was closely derived from the coupe model to ensure that the character of the original cross-coupe design is preserved. "The key lines remain intact the dramatic rising beltline, muscular shoulder running the length of the car, and the distinctive taper to the floating roofline but with a slightly higher rear roof. The finished vehicle offers impressive levels of space and versatility whilst retaining the overall essence, visual robustness and jewel-like detailing of the coupe," said Land Rover Design Director, Gerry McGovern. 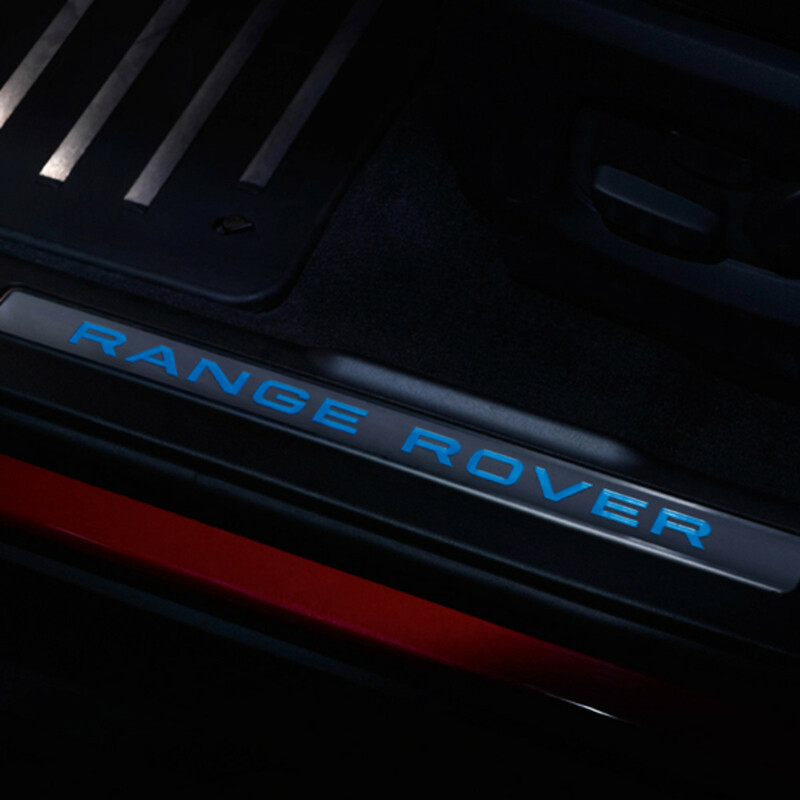 The front-end design is unchanged from the coupe, making a powerful statement of the Range Rover brand&apos;s identity with the bold horizontal graphic created by the perforated two-bar grille and distinctive headlamps. The stylish body exudes a strong sense of premium quality with its precise, tight shut-lines, striking details like the side vents, and the jewel-like quality of the slim front and rear lamps with their LED signature lighting and tapering blade indicator clusters. "With its compelling mix of bold design and superior versatility, the five-door model significantly expands the appeal of the Range Rover Evoque brand. It enables customers to choose a car which makes a strong statement, while still delivering the functionality they require," added McGovern. 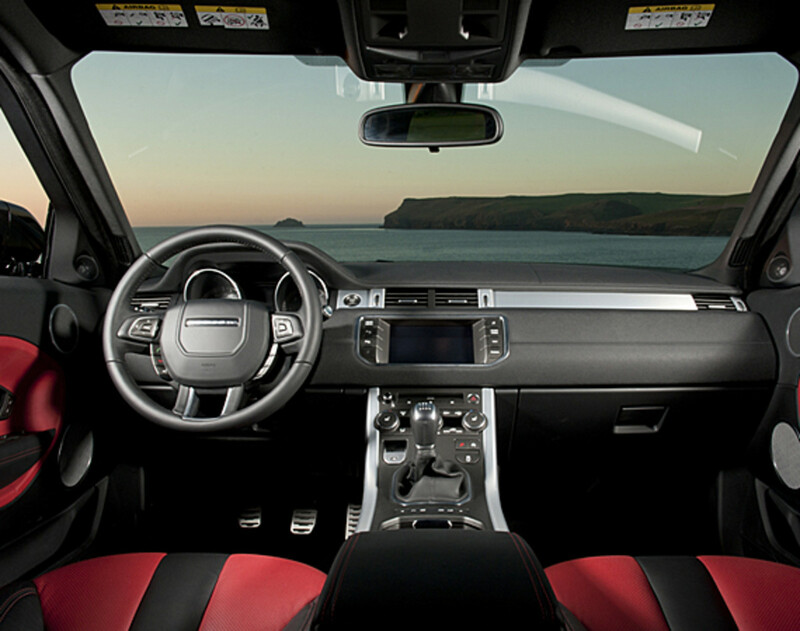 The interior of the five-door Range Rover Evoque takes the strong, clean architecture and premium quality materials of a traditional Range Rover and applies them in a more contemporary and sporting fashion. 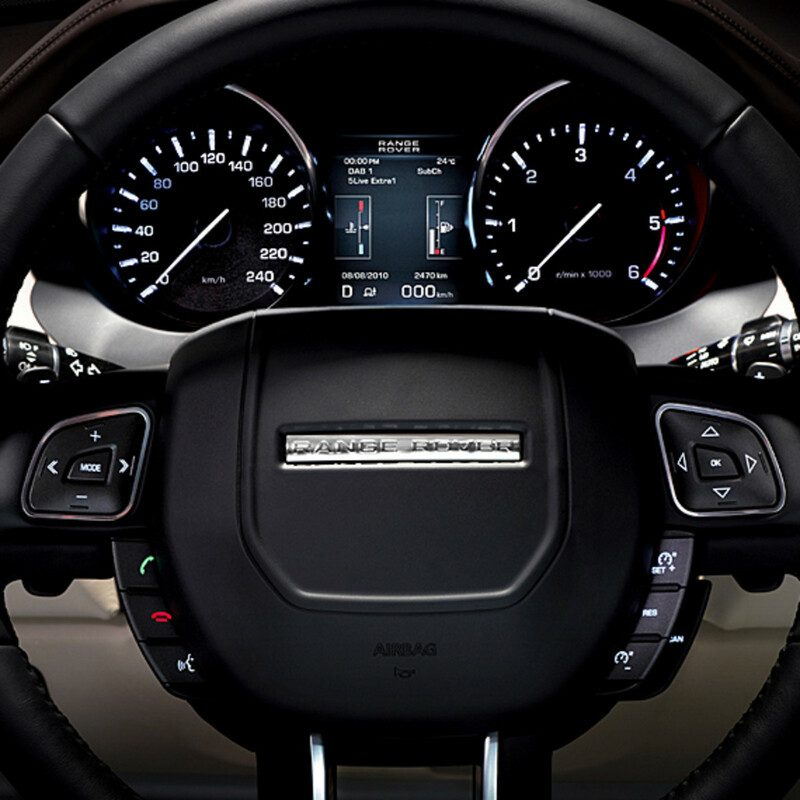 As in larger Range Rover models, the centerpiece of the cabin is the bold intersection between the solid horizontal elements of the instrument panel and the powerful vertical lines of the center console. Designers have also taken inspiration from the stylish forms of the LRX concept interior, capturing the dramatic slope of the center console, and the pure, elegant lines of the instrument panel. The design retains the concept&apos;s distinctive stowage area beneath the sloping console; the open structure echoing the themes of lightness and efficiency found elsewhere in the car. The exquisite quality and craftsmanship of the materials is highlighted by the very contemporary, clean treatment of the interior surfaces, including the flush treatment of the air vents and horizontal roller shutter in the center console. 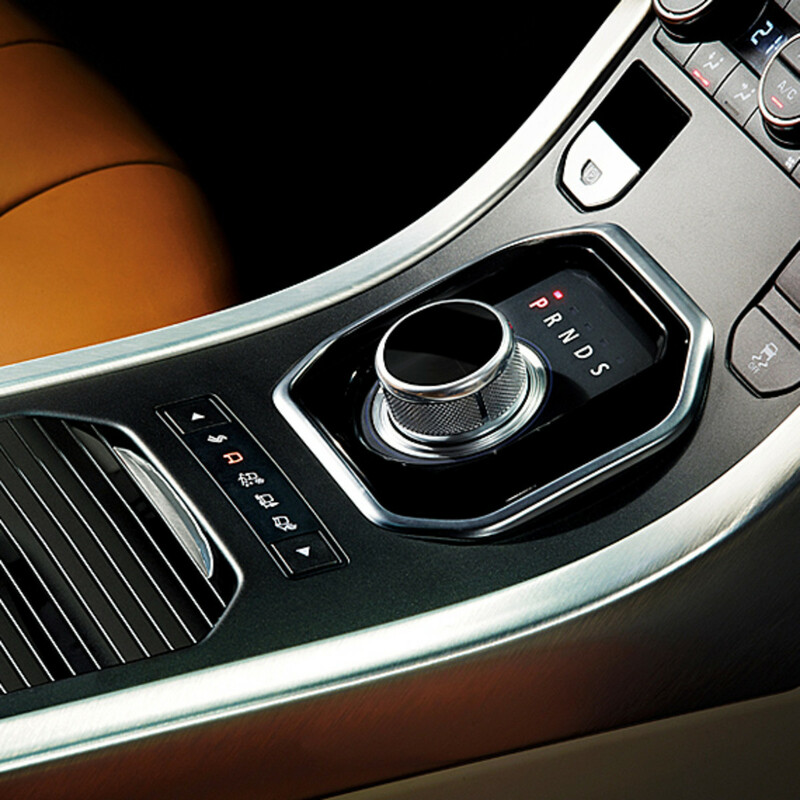 Housed under a compact curved binnacle, the instrument cluster enhances the sporting, premium feel of the interior. The twin dials have an expressive three dimensional form with illuminated chaplets and needles, and are set deep in sporty circular housings finished with bright chrome rims. An available full glass fixed panoramic roof enhances the sense of room and freedom within the deceptively spacious cabin, filling the interior with natural light. Gerry McGovern explained, "The luxurious, contemporary feel to the cabin is the perfect complement to the concept car exterior. The exquisite materials and craftsmanship, and the pure, elegant design, tell you that this is a true Range Rover interior, but one with a more sporting flavor." 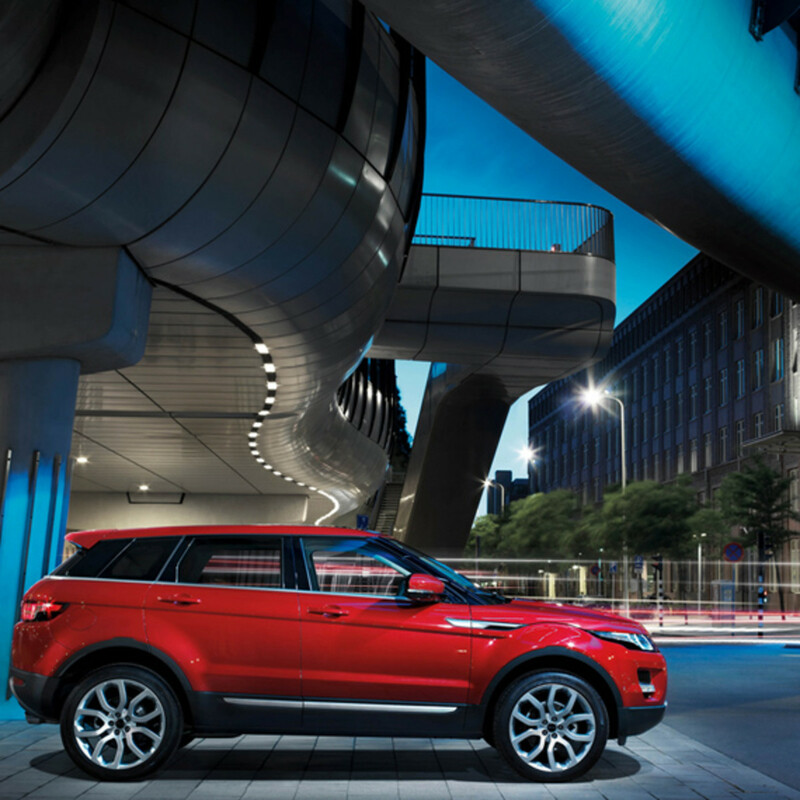 The Range Rover Evoque delivers Range Rover levels of quality and craftsmanship in every detail of the car. Particular attention has been given to selecting only the best, premium quality materials, and applying those materials with impeccable taste and care. Perhaps the most visible example is the luxurious wrapped finish of the upper instrument panel on the Prestige model. Beautifully soft high-grade hides which have been hand-picked for their exceptional touch and appearance impeccably hand-finished with twin-needle stitching. 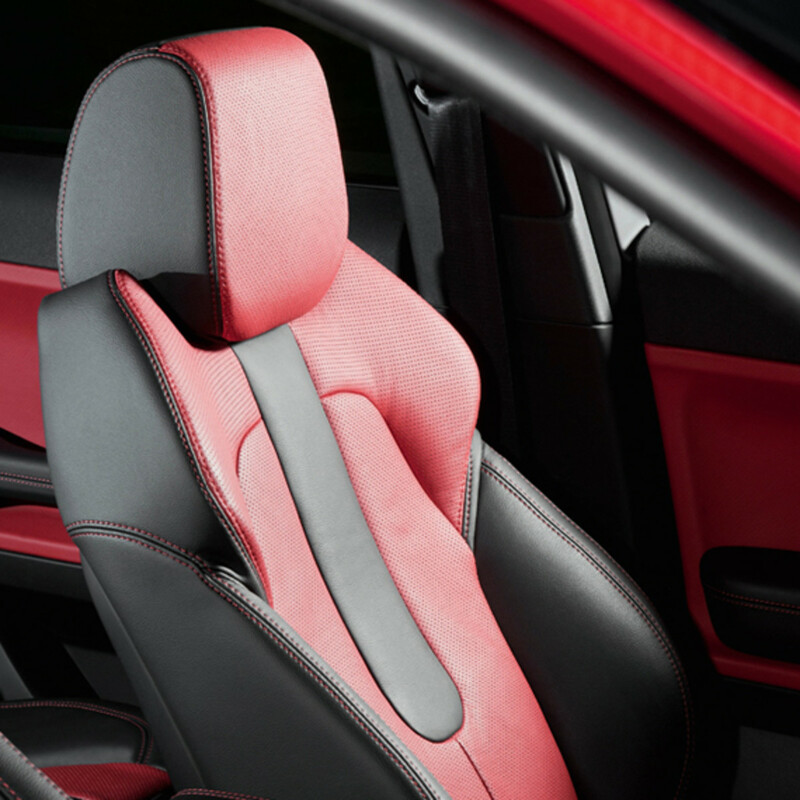 The fascia mid-section is also leather wrapped; this, together with the lavish leather trim on the door panels and seats, creates the ultimate luxury ambience. Every aspect of the stitching, even down to the size and shape of the needle, is also specified by Range Rover experts, to guarantee an immaculate finish, every time. In bold contrast to the opulent leather and soft-touch surfaces, strong visual highlights are provided by authentic metal finishes on the horizontal strip on the fascia, the surrounds to the vent controls, and the striking curved elements each side of the center console. Cool to the touch and exquisitely crafted, the metal finishes are a tactile and visual reminder of the superior interior quality. The five-door Range Rover Evoque may have a more versatile format, but its design remains completely faithful to the style of the stunning LRX Concept. Retaining the spirit of the concept car design, but without compromising core Range Rover values such as interior comfort or off-road capability, required a huge effort from the design and engineering teams. During the development process, maintaining the integrity of the LRX design was given the highest priority, and led to the adoption of new technologies and smart engineering solutions to maintain the concept car appearance. off-road geometry and ground clearance. The five-door interior offers excellent accommodation for passengers and luggage, while retaining the core elements of the classic Range Rover Command Driving Position. Gerry McGovern said, "The five-door Range Rover Evoque really does give you the best of both worlds concept car looks combined with day-to-day comfort and versatility. From its deceptively spacious cabin to its deep, accommodating trunk, this is a car which is ideally suited to our customers&apos; busy and active lifestyles." Sitting slightly lower than in one of the larger Range Rover models, the driver adopts a Sports Command Driving Position, which offers a more sporting feel but retains the important sensation of control and command. With its higher rear roofline, the five-door Range Rover Evoque adds further space and versatility to the luxurious cabin. The rear seats offer comfortable accommodation for three passengers, with each seating position having its own three-point safety belt and head restraint. In addition to generous headroom which compares very favorably to traditional sporting sedans, rear seat occupants also benefit from over 1.97 inches (50mm) more shoulder room than the coupe model. The increased window area of the five-door bodystyle heightens the feeling of light and space in the rear cabin. This sensation can be further enhanced by the full-sized glass panoramic roof, which provides a superb uninterrupted vista and offers even greater headroom for all occupants. The five-door format provides adults with excellent access to the rear seats and the outer seat positions are equipped with LATCH child seat mounts. 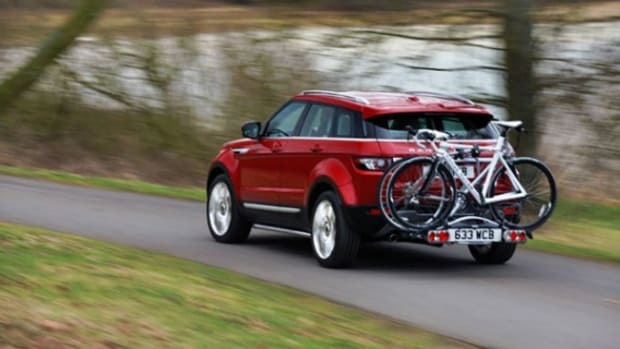 The Range Rover Evoque has a wide, deep trunk with a practical regular shape. The width of the luggage compartment has been optimized to accommodate the full length of a golf bag, with no need to remove the longer clubs from the bag. 51 cubic ft (1445 liters) available with the rear seats folded. For added convenience, the available Range Rover Smart Key system enables keyless entry to the vehicle. Additionally, the available rear tailgate is powered for ease of opening, and can also be opened remotely using the key fob. The all-new five-door Range Rover Evoque has been designed and engineered to provide drivers with a finely judged balance of sporting driving dynamics, responsive performance and sophisticated refinement. This polished driving experience is true to the values of the Range Rover brand, but adds a more dynamic and sporting character which is consistent with the exciting promise of the bold, concept car design of the Range Rover Evoque. David Mitchell, Chief Program Engineer, explained, "Market research indicates that the target customers for this car favor a more sporting driving character. Like the coupe model, the five-door Range Rover Evoque has been engineered to deliver driving dynamics with a more engaging and connected feel, without losing the poise and refinement which is an important characteristic of the Range Rover brand." 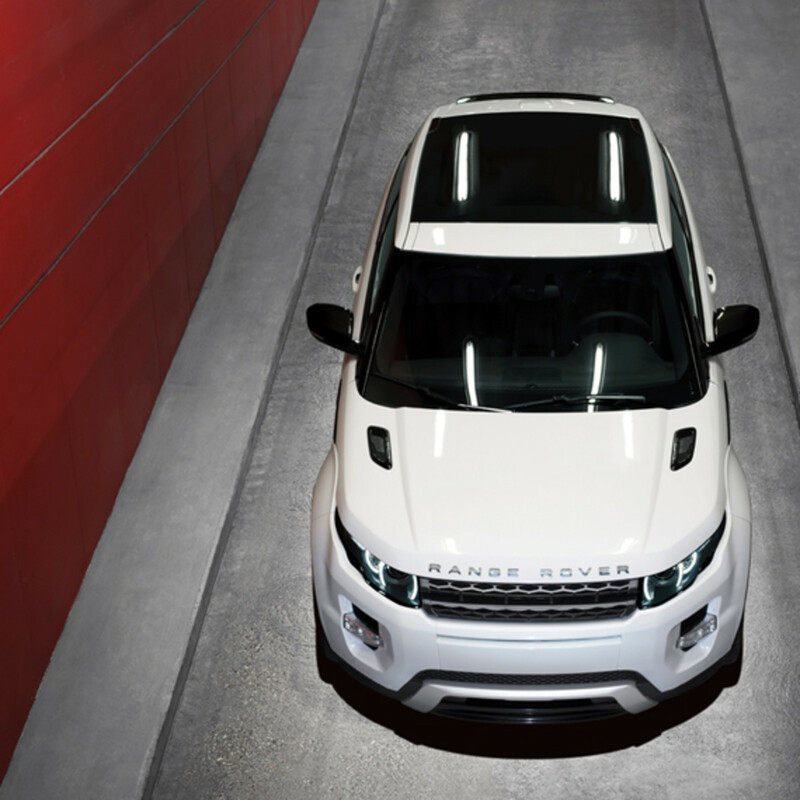 Achieving the desired dynamic character in the Range Rover Evoque required an evolution of the Range Rover DNA. Starting with the driving dynamics of the Range Rover Sport, which has a similar DNA to a luxury sports sedan; Range Rover dynamics specialists set out to deliver a more agile and connected drive. Particular objectives were to increase steering precision and agility at lower speeds, so that the car was more responsive and fun to drive in typical urban driving conditions. While the new model&apos;s lightweight, compact footprint and low center of gravity helped to achieve a more agile character, key engineering steps were required to deliver the required responses. Range Rover engineers initially focused on optimizing the stiffness of the chassis systems and body structure, followed by meticulous tuning of the suspension components and electric power assisted steering (EPAS) system. Starting with the fully independent suspension featuring long-travel coil-sprung struts front and rear, and isolated front and rear subframes, mounted to an exceptionally stiff steel monocoque bodyshell. Anti-roll bars are fitted front and rear. The suspension geometry was optimised around the vehicle&apos;s lower center of gravity, and also features a higher rear roll center and a wider track. The variable-ratio speed-sensitive EPAS system was tuned for immediate responses around the straight-ahead position, and a precise, linear character. To enhance the precision and feedback, the steering rack is solidly mounted on the front subframe. Although these changes delivered greater agility, the five-door Range Rover Evoque has handling responses which remain flattering and predictable, without any nervous reactions. 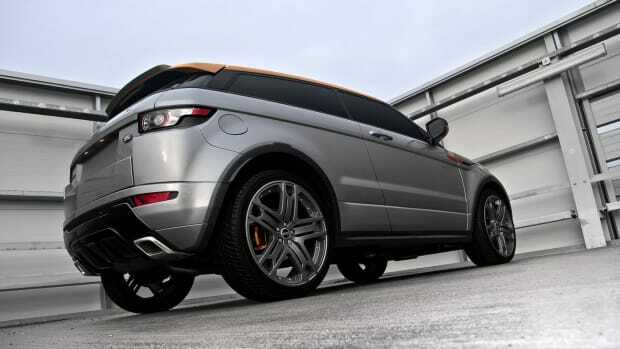 To make sure the Range Rover Evoque retained the poise and stability, which is typical of long-travel Range Rover suspension systems, engineers tuned the car to retain the same comfortable yet connected ride of the Range Rover Sport, with excellent control of body motions and low levels of body roll. This meticulous tuning of suspension bushes and spring and damper rates has ensured the new model&apos;s more sporting character has not compromised comfort and refinement. Customers of the five-door Range Rover Evoque have the opportunity to specify a state-of-the-art new Adaptive Dynamics feature which uses advanced MagneRideâ„¢ continuously variable dampers. With the MagneRideâ„¢ dampers which are more typically fitted to high performance sports cars the Adaptive Dynamics system provides an optimum balance between confident, nimble handling and a supple, well-controlled ride. MagneRideâ„¢ dampers offer infinitely variable damper settings between soft (comfort) and hard (sports) extremes, and operate by using a special damping fluid which contains magnetic particles. When subjected to a magnetic field, the fluid becomes more viscous, thus increasing the damping. This technology allows MagneRideâ„¢ to change damper settings quickly and with a wide operating range, delivering more stable and confident dynamics. The Adaptive Dynamics system monitors vehicle movements at least 1000 times/second*, reacting to driver or road inputs virtually instantaneously to give greater control and minimize body roll, providing a balanced, flat ride. The system will even sense off-road conditions, and optimize damping accordingly. Drivers can also select a Dynamic Mode via the Terrain Response® system, which modifies the damper settings to deliver even tighter body control, with flatter handling and sharper responses. 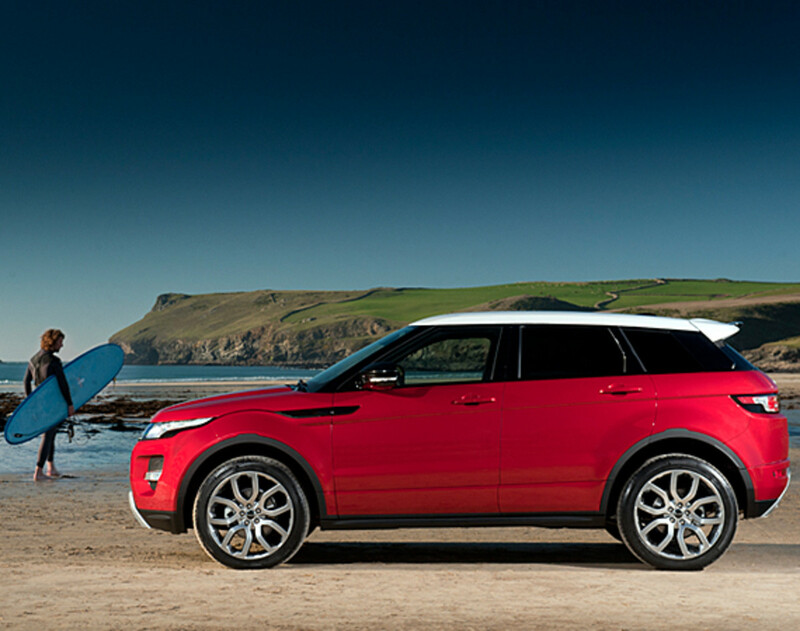 The five-door Range Rover Evoque delivers the all-weather, multi-terrain capability, which is a hallmark of the brand. In common with its larger siblings, the new model provides formidable off-road potential, which is enhanced by the company&apos;s signature Terrain Response® system. The standard permanent all-wheel drive system is an innovative full-time intelligent system, which continuously varies the front/rear torque split using an electronically-controlled Haldex® center coupling to deliver optimum grip and balance for the current driving conditions. The Haldex® coupling has been specially calibrated to suit the nimble and responsive dynamic character of the Range Rover Evoque, and to ensure it delivers a fun-to-drive experience at all speeds. 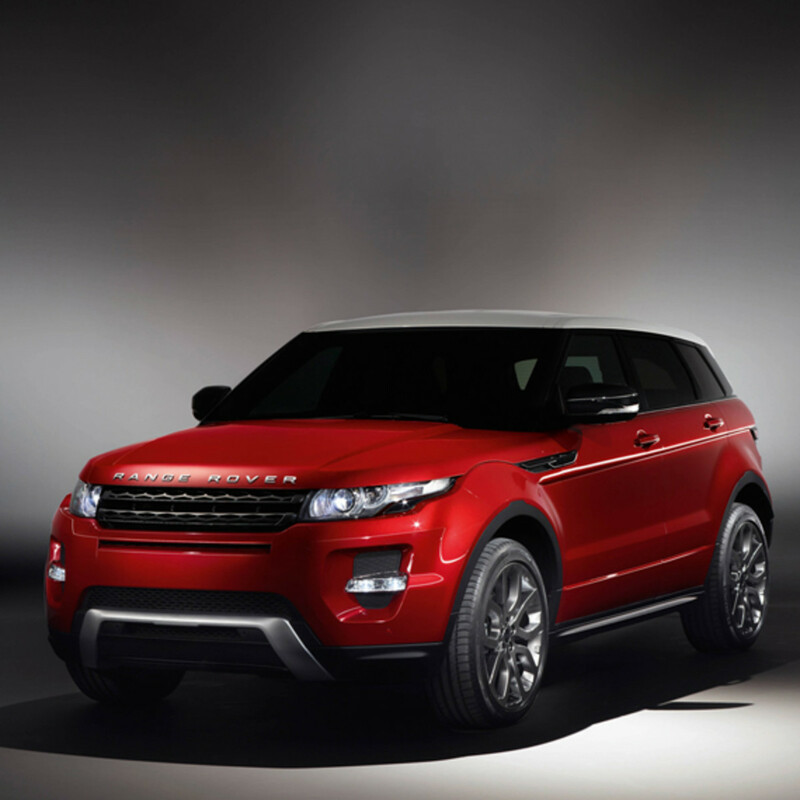 The five-door Range Rover Evoque shares its turbocharged powertrain with the coupe model. The engine offers smooth and responsive power, delivering 0-60 mph in 7.1 seconds*, blending four-cylinder efficiency with six-cylinder performance. The new 240bhp*, 2.0-liter Si4 engine combines direct fuel injection, turbocharging and twin variable valve timing for driveability and improved fuel efficiency. The Si4&apos;s efficient combustion system enables it to achieve significant reductions in fuel consumption and CO2 emissions when compared to traditional larger capacity engines of the same power. The compact all-aluminum four-cylinder engine is also substantially lighter than conventional engines with a similar output. For example, the 240bhp* 2.0-liter Si4 unit weighs around 88lbs* less than Land Rover&apos;s 230bhp 3.2-liter i6 engine. Other key engine technologies include a unique fabricated sheet metal exhaust manifold (for quicker warm-up and lower emissions), optimized low-friction design with special treatments for the piston rings and tappets, and a state-of-the-art electronic management system. Twin balancer shafts and an optimized all-alloy engine construction ensure superior refinement with smooth, sophisticated performance. Range Rover engineers have applied meticulous attention to detail to ensure that the five-door Range Rover Evoque has a refined and harmonious sound quality under all driving conditions. Innovative technologies, including advanced computer simulations and state-of-the-art analysis tools like sophisticated acoustic cameras, have been used to identify and remove all undesirable sounds. The advanced turbocharged engine is inherently quiet and smooth, but further careful optimization of the engine installations has made it possible to reduce powertrain sound levels. Sources of unwanted noise have been isolated or eliminated, resulting in a refined sound quality across the full operating range. Wind noise has been minimized through analysis with computational fluid dynamics, and exhaustive wind tunnel tests. Key areas, such as the shape of the A-pillar and door mirrors, were optimized very early in the development process. A special acoustic windshield lamination, as used on the larger Range Rover models, further reduces wind noise and also helps to eliminate high-frequency combustion noise. Road noise in the Range Rover Evoque has been comprehensively managed through the use of stiff, lightweight alloy suspension components, along with carefully optimized bushings. These features work in conjunction with extremely stiff suspension attachment points within the bodyshell and accurately applied sprayed insulation material, to further minimize noise, vibration and harshness (NVH). All other operating sounds within the car, from door closing sounds to the noises made by switches and motors, have been analyzed and refined during the development process to create a harmonious and premium sound quality for all occupants. David Mitchell said, "It was critical that the five-door Range Rover Evoque met the same standards of refinement as the larger models in the line-up. When drivers experience the new model, they will recognize the characteristic Range Rover qualities of relaxed and effortless performance and the tranquil interior environment." The all-new Range Rover Evoque sends a powerful message that the company is serious about sustainability, and determined to deliver vehicles which are both relevant and highly desirable. As a smaller, lighter and more efficient new Range Rover model, the Range Rover Evoque addresses the growing consumer need for more environmentally friendly vehicles. David Mitchell said, "The greener credentials of the Range Rover Evoque stem from a comprehensive approach to reducing its environmental impact, not just during customer use, but throughout the entire life-cycle of the car. 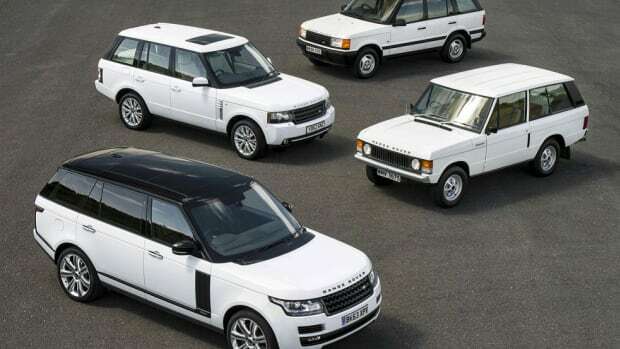 This whole-life approach allows us to consider the best ways of minimizing the overall carbon footprint, taking account of development, manufacturing and end-of-life recycling, so that we can make the smartest, most sustainable decisions"
The first step in creating a more sustainable Range Rover was to make it more space efficient. Following the lead of the LRX concept, the Range Rover Evoque is the smallest Range Rover model ever, packing the same level of luxury and technology but within a more efficient footprint. The five-door model shares the same compact dimensions as the coupe, with identical overall length and width, but a slightly higher rear roofline. 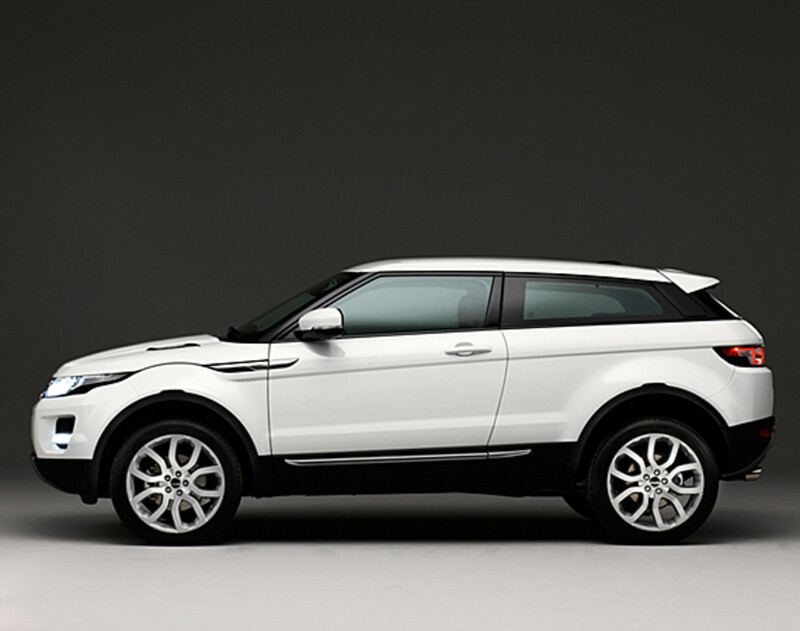 The smaller size of the Range Rover Evoque can be illustrated by a comparison with the Range Rover Sport. At 171-inches long (434cm), the five-door Range Rover Evoque is a 17 inches (432mm) shorter, and with its dramatic coupe roofline it sits around 6 inches (152mm) lower too. A smaller vehicle is a more sustainable vehicle, and the more efficient size of the Range Rover Evoque has helped engineers minimize its weight, improve aerodynamic performance and reduce the quantity of materials required to produce it. four-cylinder turbocharged gasoline engine, leading not only to excellent performance, but also to minimized fuel consumption. It is worth noting that the compact footprint of the five-door Range Rover Evoque has not been achieved at the expense of traditional Range Rover virtues. The car retains generous interior legroom and headroom, a very practical trunk, plus highly capable off-road geometry and ground clearance. Weight saving was a primary objective in the development of the Range Rover Evoque, and engineers have applied a range of advanced lightweight materials to make this the lightest Range Rover model ever, with weights for the five-door starting at just 3,816lbs (1,731kg)*. Reducing weight creates a virtuous circle, as lighter weight in one area of the car makes it possible to introduce lighter components in another, and so on. As the overall weight drops, performance improves and both fuel consumption and CO2 emissions are reduced. Additional weight savings have been achieved by smart engineering decisions in all areas of the car, ranging from a lighter windshield with acoustic lamination and lighter weight alloy wheels, to lightweight laser-welded seat structures and optimized sprayed insulation materials. Land Rover&apos;s inline i6 engine with a similar power output. The state-of-the-art engine featured in the five-door Range Rover Evoque uses the latest powertrain technology to deliver improved fuel efficiency. The all-new lightweight, 2.0-liter Si4 engine employs the latest generation of high pressure direct-injection technology, together with low-inertia turbocharging and twin independent variable valve timing, to create an exceptionally efficient combustion system. Compared to conventional larger capacity engines with a similar power output, the new Si4 engine can reduce CO2 emissions by up to 20 percent*. 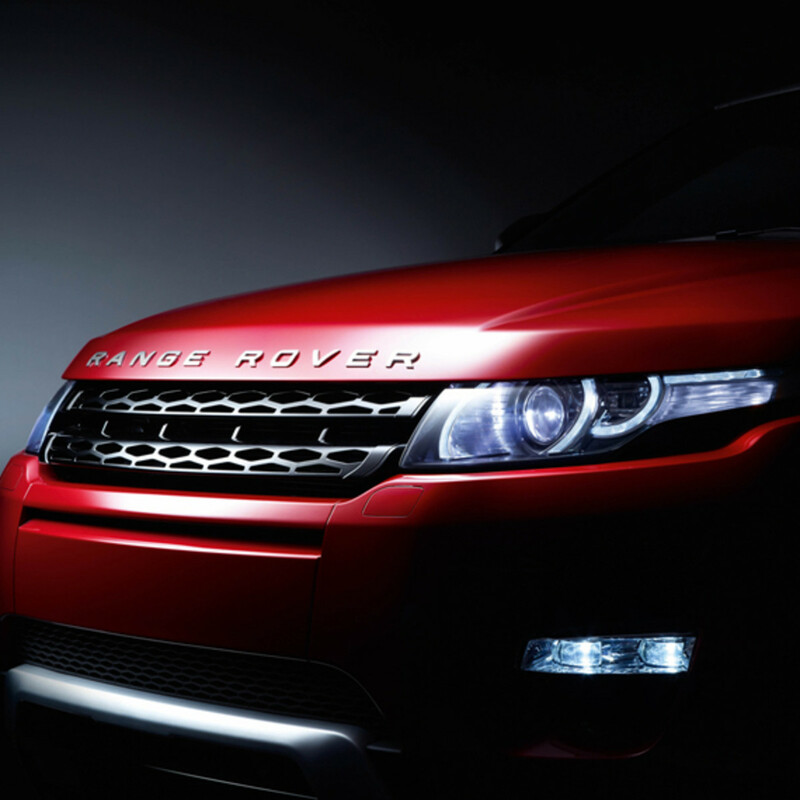 The Range Rover Evoque benefits from the latest generation AWF-21 six-speed automatic transmission, which has been extensively revised to improve its operational efficiency, including gear train optimization, advanced idle control, and the adoption of low viscosity transmission fluid. Range Rover engineers have rigorously eliminated parasitic losses from every area of the five-door Range Rover Evoque, to increase fuel economy. As part of the comprehensive effort to minimize the car&apos;s ecological impact, the Range Rover Evoque maximizes the use of more sustainable materials. Recycled materials have been used wherever possible. Each car uses 35lbs (16kg)* of recycled plastic material. Parts with recycled content include: headliner, center console, wheel arch liners, air cleaner, cooling fan and shroud, air ducting, side under trays, parcel shelf, engine cover and subwoofer box. High quality natural and renewable materials, such as leather, cotton, cardboard and rubber, are used extensively, amounting to 46lbs (21kg)* of material in every vehicle. 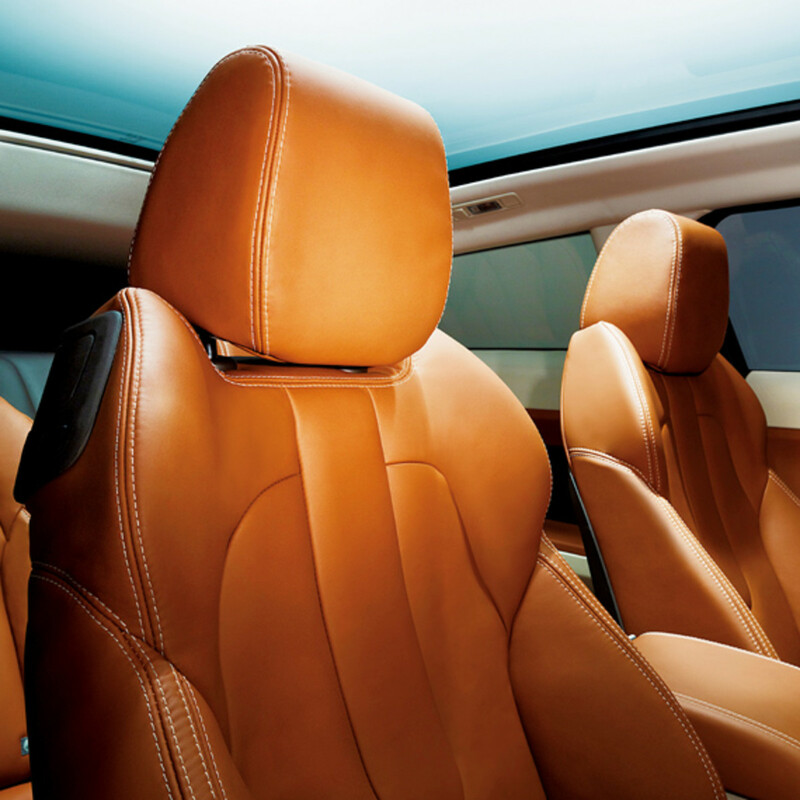 Key examples include the generous quantities of leather used on the seats, instrument panel and door casings, and natural materials used in the carpets and body insulation. - High quality Morzine trim fabric used on the headlining and pillars is entirely produced from recycled polyester sourced from recycled bottles and fibers. Using recycled material for this fabric results in a 66 percent* lower energy demand and 54 percent* lower carbon footprint during production*. - Authentic metal interior finishes used on all models on the center console and the fascia strip are produced from 95 percent* recycled aluminum, significantly reducing the energy requirement in production. The all-new five-door Range Rover Evoque has been designed and engineered to provide customers with the comprehensive range of premium technologies they expect from a Range Rover vehicle, just delivered in a more compact package. To maximize control, comfort and enjoyment on board for the driver and passengers, the Range Rover Evoque is packed with a host of desirable and intuitive technologies, which are normally associated with much larger, more expensive models. The broad array of premium Range Rover equipment comprises the latest technologies for controls, connectivity, comfort and convenience, including some highly distinctive and original signature features plus stunning new high-end Meridian audio systems. David Mitchell said, "The five-door Range Rover Evoque provides the complete Range Rover experience, but packaged into a smaller, more attainable car. Many of the new customers will be more youthful, tech-savvy buyers, whose expectations will be exceeded with the rich array of premium features that will make ownership a real pleasure." 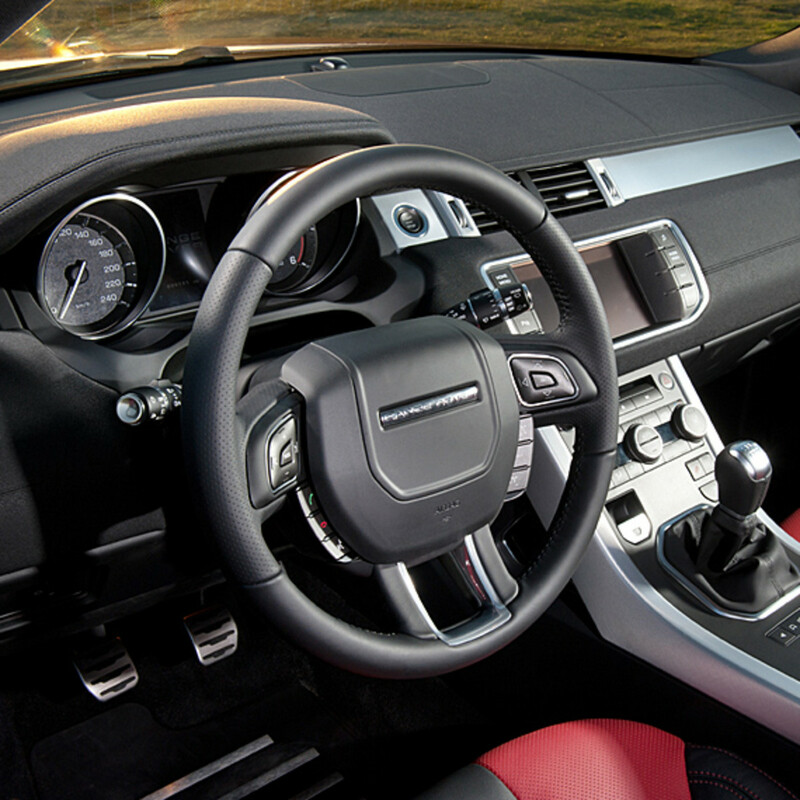 From the steering wheel, the five-door Range Rover Evoque is distinguished by a carefully conceived system of controls and displays which combines a stylish, uncluttered layout, state-of-the-art functionality and ease of use. At the heart of the control system is the Range Rover brand&apos;s 8-inch (203mm) high-definition touch-screen display with its crisp, elegant graphics and simple, highly intuitive menu structure. The large 8-inch (203mm) touch-screen provides the primary control and display system for a wide range of features including audio, video, navigation and phone. The screen graphics have been precisely honed, giving the impression of three-dimensional buttons, beautifully lit with subtle chrome detailing. Simple hard keys on either side of the display provide convenient short-cuts to the most commonly used screens, such as Home, Audio/Video, Navigation and Phone. Complementing the touch-screen, a full color 5-inch (127mm) display between the two instrument dials presents the primary vehicle-related information, such as temperature and fuel levels, gear position, Terrain Response® mode, and cruise control/Hill Descent Control information. Other highly intuitive controls include the intuitive heating, ventilation and air-conditioning (HVAC) dials, twin five-way toggle switches on the steering wheel, and a highly sophisticated voice control system which provides &apos;Say What You See&apos; prompts in the cluster display to help the driver input the required commands. Tech-savvy customers will appreciate the capabilities of a comprehensive state-of-the-art connectivity package, which enables them to enjoy the benefits of a wide variety of portable devices and mobile phones while travelling in the car. Hands-free mobile phone use is enabled by Bluetooth® connectivity, which allows a compatible handset to communicate with the car&apos;s built-in phone system. The phone can be controlled via the 8-inch (203mm) touch-screen or the steering wheel controls, and the system automatically downloads the latest phonebook contacts, so that making a call is simple and safe. The Range Rover Evoque also supports Bluetooth® audio streaming, so that customers can enjoy music stored on their phone, or other portable Bluetooth® device, via the car&apos;s audio system. Essential connectivity for an iPod® and other portable MP3 digital music players or memory sticks is provided by a comprehensive range of inputs including a direct iPod® connection, USB sockets and an auxiliary input. The primary iPod® functions can be easily controlled through the 8-inch (203mm) touch-screen display. To complement the groundbreaking style of the exterior, Range Rover designers and engineers have made sure the five-door Range Rover Evoque has a host of other distinctive technologies, which bring an added dash of cool to the ownership experience. 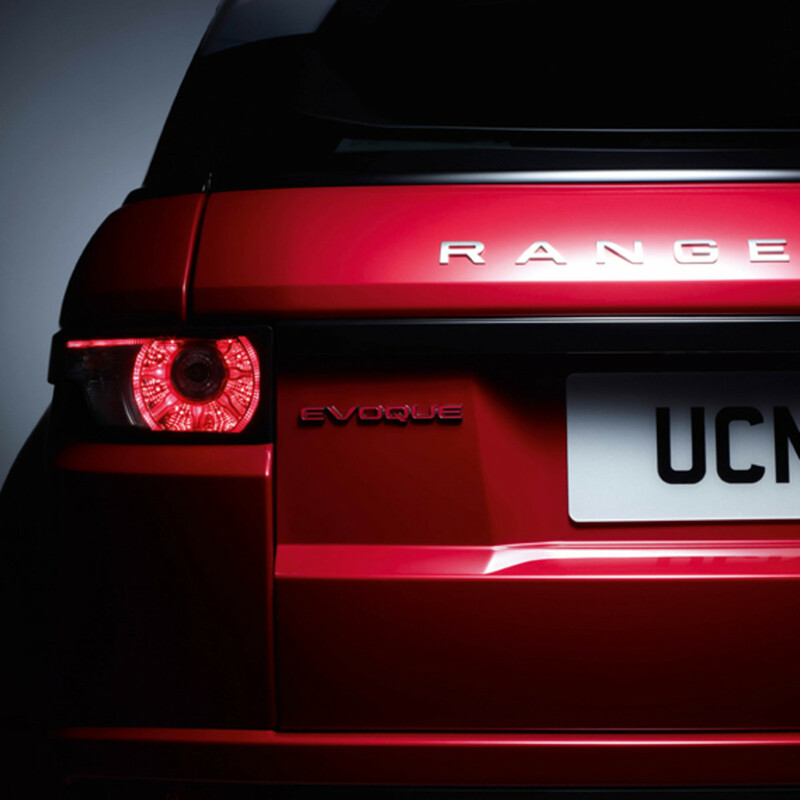 Lighting plays a big part in the special appeal of the Range Rover Evoque. First to catch the eye is the powerful signature graphic in the front running lights, created by innovative LED light-blade technology. A similar graphic is repeated in the stunning LED rear lights, with their jewel-like three dimensional petal design. Approach the vehicle at night, and you will also see a bold brand graphic alongside the front doors, illuminated by the &apos;approach lights&apos; which shine from the mirrors. More special touches greet you when you enter the car. The interior displays and ambient lighting come to life with a precisely-choreographed animated start-up sequence, which features a series of sophisticated graphics. The stylish solid aluminum rotary shifter completes the &apos;greeting&apos; as it rises silently into the driver&apos;s hand. LED ambient lighting provides subtle and precise illumination within the cabin, with a range of colors, which can be chosen by the driver to suit their mood. Select Dynamic Mode, and a sporting red color scheme fills the interior as well as in the instrument dials and cluster display. To complete the range of sensations, the first panoramic roof ever fitted to a Range Rover vehicle can be specified, providing an all-round vista which helps to make every journey a special occasion. The huge, unobstructed glass panel has a stylish dark tint, with a special surface treatment to offer a high degree of solar protection. When additional shade or privacy is required, an electric fabric sun blind with a solar reflective coating can be extended across the full surface of the roof. For the audiophile, the Range Rover Evoque is the first Range Rover model to offer breathtaking new sound systems developed in partnership with the specialists Meridian, a world leader in audio technologies and digital sound processing. This level Meridian audio technology is exclusive to the next generation of Range Rover models, and promises sound quality, which equals the company&apos;s high-end home systems. 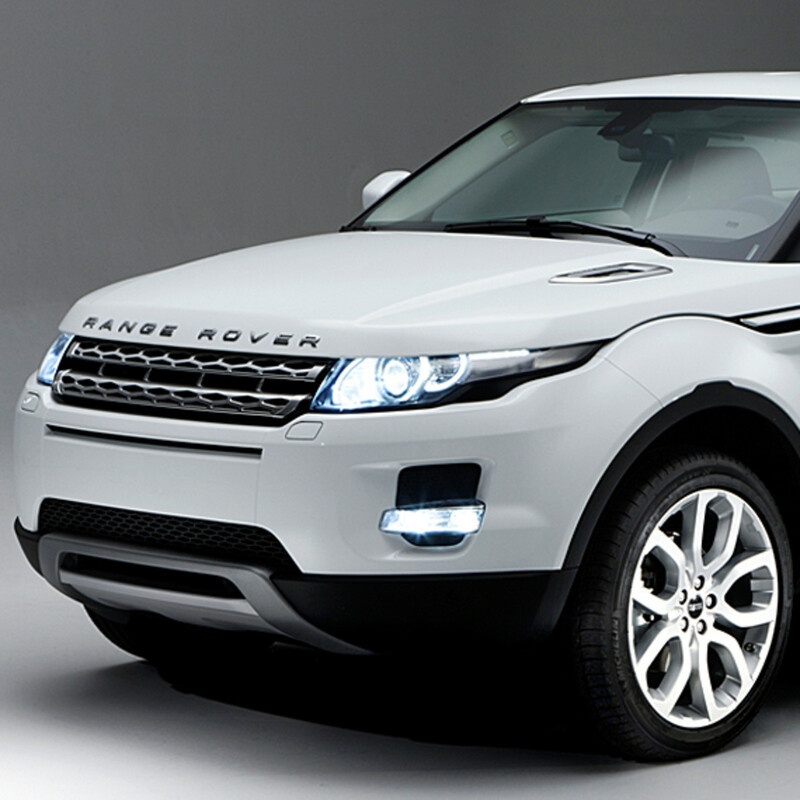 The five-door Range Rover Evoque is available with two high end Meridian sound systems. A powerful 380W 11-speaker arrangement is offered as standard while a top of the range 825W 17-speaker system with full surround sound comes as an option. Both offer super sharp, clear sound quality and their peak power outputs are based on the 0.2 percent Total Harmonic Distortion with Noise (THD+N) rating. State-of-the-art amplifiers incorporate Meridian&apos;s latest digital processing technology to ensure perfectly optimized sound quality, while both systems feature branded Meridian high-efficiency speakers with lightweight neodymium rare earth magnets for exceptional clarity and dynamics. Range Rover and Meridian audio specialists have also applied the sophisticated Meridian Trifield surround staging technology, along with Dolby® Pro Logic® IIx and DTS® Neo:6®; and Audyssey MultEQ® XT audio tuning system, which digitally corrects any imperfections created by the cabin environment to deliver accurate, enveloping, and distortion-free sound for all seating positions. To complete the entertainment options, the Range Rover Evoque is also available with a single disc CD player with hard drive MP3 digital music file storage, and FM/AM Sirius® tuners with a high performance twin antennae system. For rear seat passengers, there is an available comprehensive entertainment package, which features full 8-inch (203mm) video screens in the front headrests, a dedicated touch screen remote control, and state-of-the-art digital infrared wireless headphones which provide stunning DVD-level sound quality. The five-door Range Rover Evoque is equipped with the latest generation of smart driver assistance technologies to help make life behind the wheel as safe and stress-free as possible in today&apos;s congested driving conditions. - Surround Camera System One of the Range Rover brand&apos;s signature features, the system uses five digital cameras, discreetly placed around the car, providing a 360 degree, real-time view of the surrounding area on the touch-screen display. The driver can display the camera images independently or in combination, depending on the requirements in the current driving conditions. The rear camera can be used to assist with hitching and unhitching trailers. The tailgate camera is also designed to operate independently as part of the reversing camera system, which presents the camera image on the touch-screen display, with special graphics overlaid to show the current vehicle trajectory and the distance from any fixed objects. 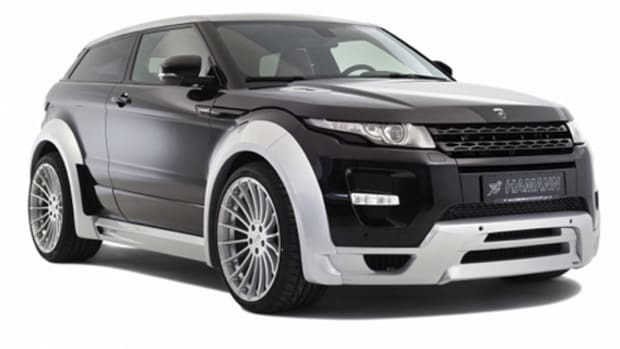 - Adaptive/Auto-Dipping Headlights The Range Rover Evoque is available with xenon headlamps with an adaptive feature, which follows the curves in the road, and provides additional illumination in tight bends. An auto-dipping function detects ambient light levels and the presence of oncoming traffic, and switches automatically between high and dipped beam. Those small extra touches can make a real difference to comfort and well-being during day-to-day driving, and the five-door Range Rover Evoque offers a generous selection of thoughtful and relevant features which help to make ownership a true pleasure. - Heated windshield, seats and steering wheel For those cold winter mornings, the Range Rover Evoque offers the convenience and safety of a heated windshield, plus the comfort of individually adjustable heated front seats and a heated steering wheel rim. - Keyless entry system and powered tailgate The Range Rover Smart Key system enables keyless entry and start. The powered tailgate provides added practicality and can be opened remotely using the key fob. 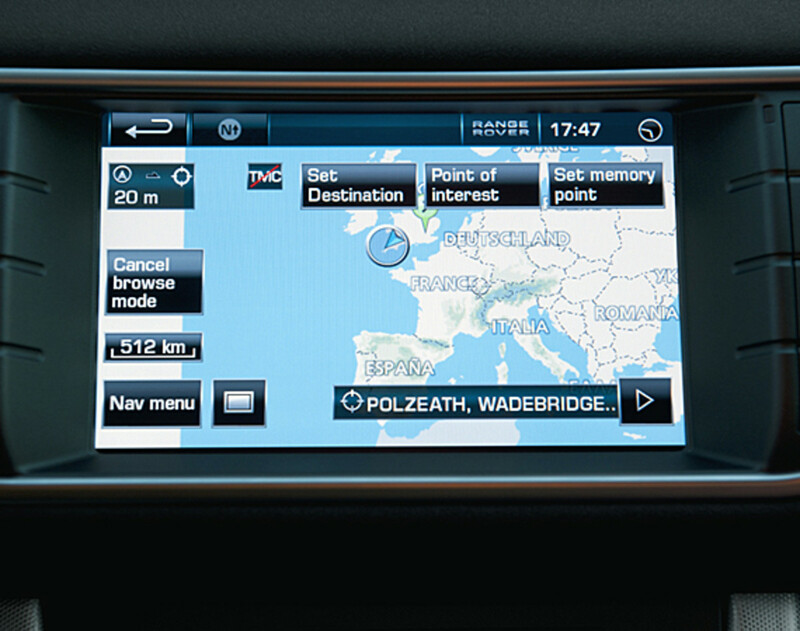 - Hard drive navigation system The latest generation of hard drive based satellite navigation system is available in the Range Rover Evoque, and features advanced functionality including turn-by-turn directions in the cluster display. The all-new five-door Range Rover Evoque has been engineered, developed and tested to the same exacting standards as the larger models in the Range Rover line-up. Over 40 years of expertise in body and chassis systems, four wheel-drive drivelines and multi-terrain technologies have been applied to the Range Rover Evoque, to ensure that it delivers the refined performance and all-weather, multi-terrain capability which are hallmarks of the brand. David Mitchell stated, "While the Range Rover Evoque is geared towards delivering sporting and fun-to-drive handling on the road, it will still be at home on a variety of terrains. Exclusive technologies, like the patented Terrain Response and Hill Descent Control systems, provide the Range Rover Evoque with a unique competitive advantage when the going gets tough." The five-door Range Rover Evoque features an all-new structure and suspension system which have been developed to deliver outstanding dynamics both on- and off-road, while preserving the stunning sporting profile of the original LRX concept car. The exceptionally strong, lightweight steel monocoque body structure has been developed to deliver outstanding stiffness and refinement together with excellent crash performance. The structure was optimized using the latest state-of-the-art computer multi-dimensional simulation tools, and uses 18 percent* of special high-strength and Boron ultra-high-strength steels in strategic load-bearing areas. Mounted to this incredibly stable structure, the fully independent suspension system of the Range Rover Evoque features coil sprung struts front and rear together with isolated front and rear subframes. The supple, long-travel suspension design, large-diameter gas damper struts, and extremely stiff isolated subframes all contribute to the new vehicle&apos;s well-controlled and absorbent ride, and its confidence in challenging off-road conditions. The optimized steel structure of the five-door Range Rover Evoque protects occupants using an incredibly strong and stable safety cell, which is complemented by a comprehensive system of airbags and restraints. The ultra-high-strength Boron steel has been used in key parts of the crash safety cell to resist deformation and intrusion during impacts, including the A- and B-pillars and the sills. The occupant safety package includes a carefully optimized restraint system including driver and passenger airbags, knee airbags, and side curtain and thorax airbags. Pedestrian safety was given a very high priority, with the design for the front-end, bumpers, hood and cowl area undergoing intensive optimization to ensure that the structure minimized potential injuries. 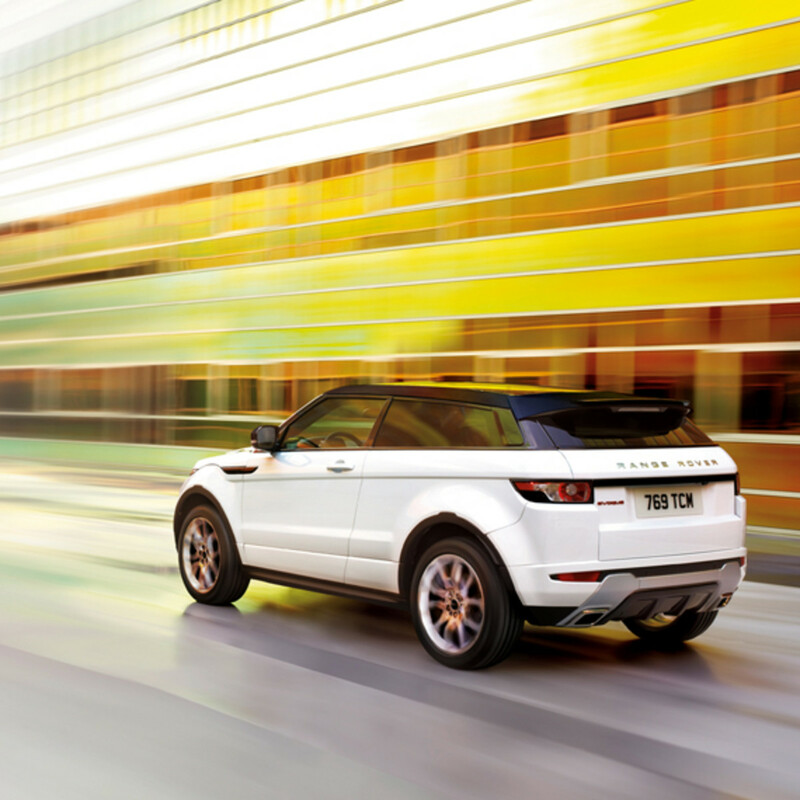 The five-door Range Rover Evoque features a powerful all-disc braking system for confident stopping in all conditions. Generous disc diameters provide a huge thermal capacity, providing formidable, fade-free stopping performance, which equals that of premium sports saloons. 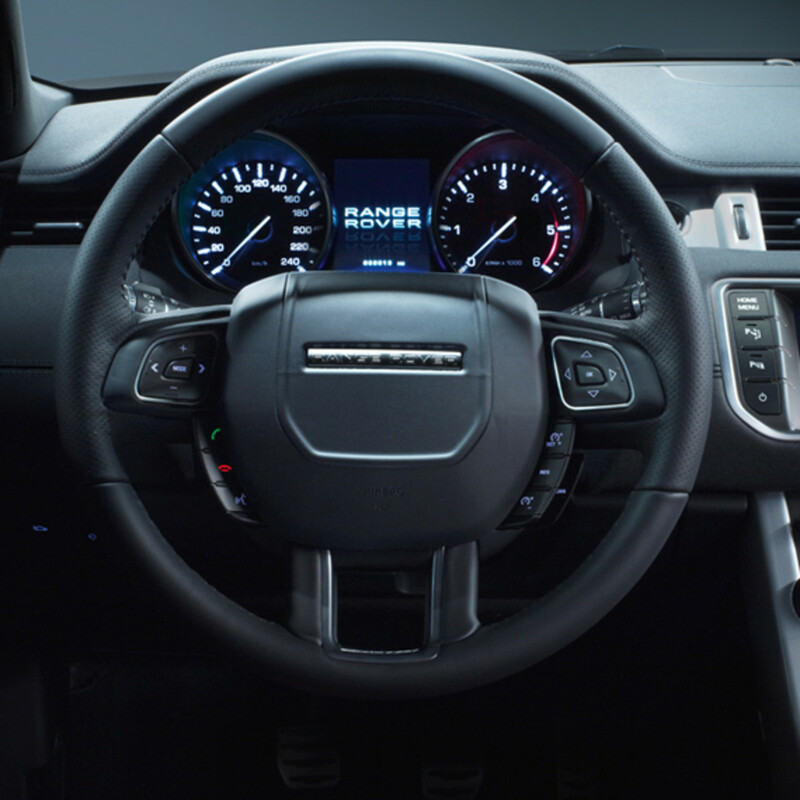 Like larger Range Rover models, the Range Rover Evoque is equipped with a convenient and effective electronic park brake, activated via a switch in the center console, which disengages automatically when the car moves off. The Corner Brake Control function has been carefully calibrated to prevent rear end instability when braking in corners. The system optimizes the side-to-side braking balance for all four wheels, to help ensure that the car follows the driver&apos;s intended path. Active safety performance is further enhanced by a comprehensive range of state-of-the-art traction and stability systems, configured using Land Rover&apos;s expertise in multi-terrain performance to maximize stability and safety in the widest range of driving conditions. At the heart of the systems is a sophisticated electronic control unit which monitors the car at all times, and can individually adjust the braking forces and engine torque applied to each wheel to optimize the handling and help the driver retain control in extreme maneuvers. The control unit takes into account a wide variety of inputs including individual wheel speeds, cornering yaw rates, longitudinal and lateral acceleration, vehicle speed, gear and clutch engagement, brake pressure, accelerator position and the settings of the hill descent and Terrain Response® systems. To complement the car&apos;s responsive on-road handling, the Range Rover Evoque features refinements to the Dynamic Stability Control and Roll Stability Control systems, which further enhance cornering behavior and stability. The car also includes a new Hill Start Assist function, which holds the brakes for a few seconds to help the driver pull away smoothly and safely on steep inclines, and Trailer Stability Assist for improved towing safety. Like all Range Rover vehicles, the five-door Range Rover Evoque makes use of a unique suite of technologies to maximize performance and safety in challenging on- and off-road conditions. The primary technology is Terrain Response®, which adapts the responses of the car&apos;s engine, gearbox, center coupling and braking/stability systems to match the demands of the terrain, optimizing drivability and comfort as well as maximizing traction. The Range Rover Evoque has four Terrain Response® settings, selected via a control on the center console: General Driving (on-road and easy off-road); Grass/Gravel/Snow (slippery conditions, on- and off-road); Mud and Ruts; and Sand. An additional Dynamic setting is available for cars specified with Adaptive Dynamics. To optimize safety and control on steep gradients, the Range Rover Evoque also offers Hill Descent Control (HDC) and Gradient Release Control (GRC). HDC automatically restricts speed downhill using the anti-lock brakes, and has been enhanced for improved performance, with a revised interface to help the driver adjust the target speed more easily. GRC is linked to HDC, and progressively releases the brakes on very steep or more gradual slopes, for maximum control. With its compact size and concept-car looks, the five-door Range Rover Evoque is clearly a new kind of Range Rover vehicle, but it has been subjected to exactly the same punishing test and development regime as the larger Range Rover models. A whole fleet of development vehicles are being subjected to twelve months of grueling tests, covering millions of miles between them to ensure that the Range Rover Evoque achieves the same standards of ruggedness and multi-terrain versatility as every Range Rover vehicle before them. 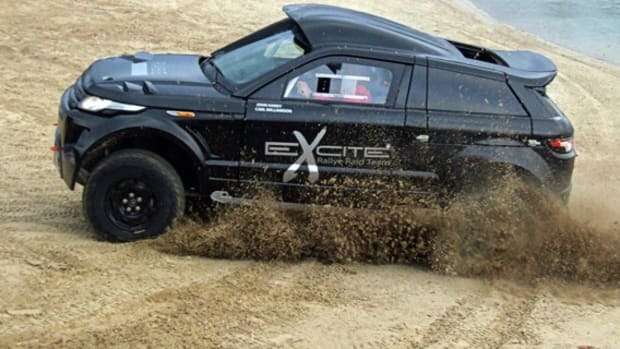 An extensive team of engineers is dedicated to prototype development and testing, travelling to over 20 countries worldwide to test in extremes of climates over a variety of road surfaces and altitudes. From the frozen extremities of Europe and Canada, to the searing heat and dust of the deserts in the Middle East and America, to the Autobahns in Europe and city traffic in Tokyo, the Range Rover Evoque is being validated against every element the earth can throw at it. - Infamous off-road test cycle encompassing thousands of kilometers through the unique deep mud and clay of the Land Rover test center at Eastnor Castle proving grounds, the MIRA and Gaydon durability circuits, and the deep water and ruts of the military proving grounds designed to challenge tanks and personnel carriers. *Data based on manufacturer&apos;s estimate. Actual may vary.